Estate (private use): approx. 780 m², closed plot (fence), in a hillside, trees, natural surroundings, with plants. Outdoor facilities(private use): terrace 35 m², further terrace 18 m² (roofed), furnishing provided, flattop barbecue. 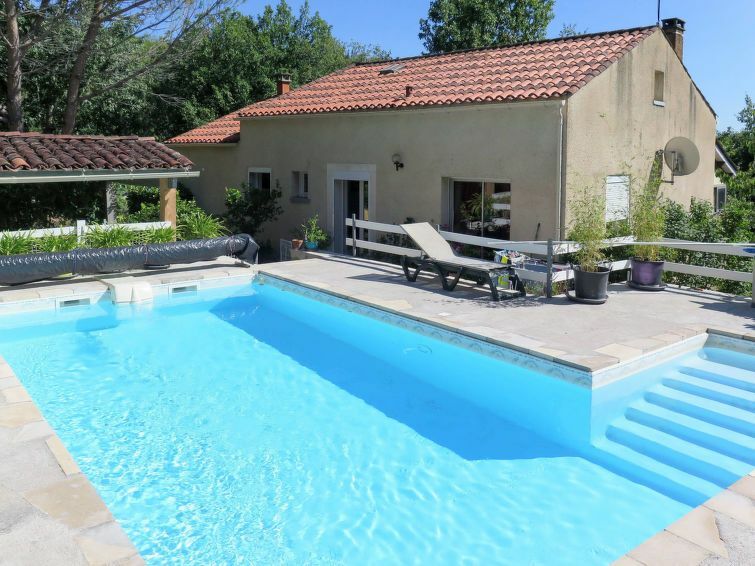 Pool (private use): 8.0 x 4.0 m, 1.40 m deep, open throughout the entire season, secured by a fence, salt water pool care, pool maintenance by the owner 1 time(s) per week. Pool area: tiled, 4 deck chairs, sunshade. Center Lamagdelaine in approx. 800 m. Cahors in approx. 7 km. Next shopping possibility in approx. 800 m. Next supermarket (Cahors) in approx. 7 km. detached house, 4 people, 3 room/s, 2 bedroom/s, 1 bathroom/s, approx. 120 m², 1 floor/s. Please note: The upper floor will be closed. Furnishing: holiday standard, pleasant, tiled floor, parquet floor. Equipment: satellite TV; internet access Wi-Fi (included); washing machine, iron/ironing board; oil central heating. Living room: sofa, 2 x armchair, exit to the veranda. Living room/veranda 2: exit to terrace. Dining area: in the living room, exit to the veranda. Kitchen: separate, further dining area for 3 people, exit. Kitchen/ cooking equipment: 3 induction fields, oven, microwave oven, dish-washer, american-style refrigerator, coffee machine, coffee machine with pod system, water boiler, toaster. Local service charges Final cleaning by tenants or against payment, € 80. Holiday resort tax. Linen/towels available (beds are ready-made upon arrival). Deposit € 400 (in cash). Cot/​High chair free of charge (on order). Pet 1 pet allowed, € 20 per stay (please advise prior to arrival; additional animals on request only).